If you have been reading me for a while you know about my eternal love of cottage cheese. 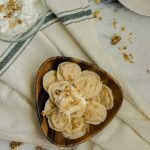 In a post a couple of weeks back I have written a whole guide to making Russian-style cottage cheese at home in 3 different ways. Today I am going to share with you some of my favorite cottage cheese breakfast recipes. 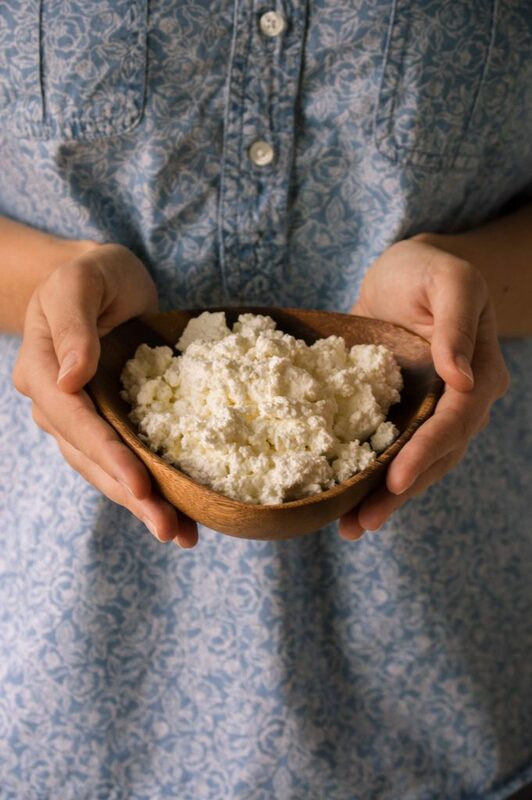 I don’t have to explain to my fellow Russian expats why you need to make cottage cheese at home instead of buying it: whatever they sell in supermarkets bears little resemblance to the real thing. I also don’t need to explain to Russians what to do with all that cottage cheese you prepare from scratch: every Russian woman knows at least half a dozen recipes that feature tvorog (that’s what we call cottage cheese in Russia). My precious! Cottage cheese I prepared from scratch. But I do, however, want to share my favorite cottage cheese breakfast ideas with the rest of the world! After you spend 48 hours making tvorog, it is fair to ask: what to do with it now? Well, one option is to mix it with a little bit of sour cream and something sweet like jam, sugar or honey. 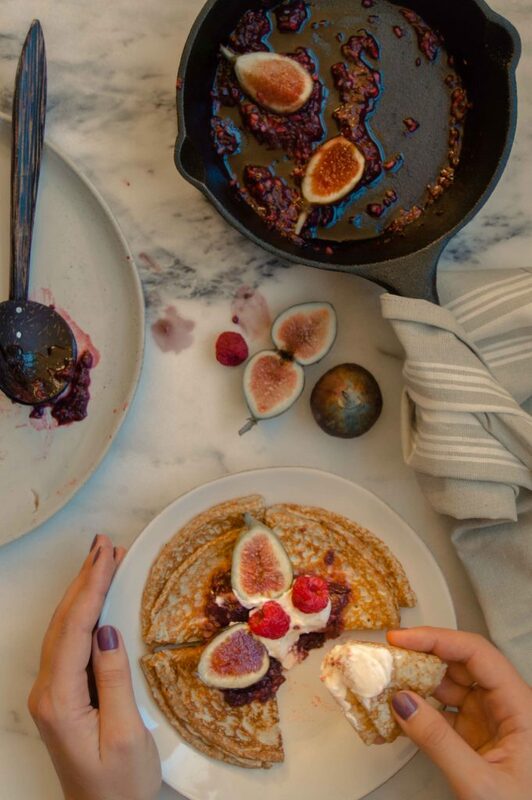 Delicious breakfast that will take you seconds to prepare. 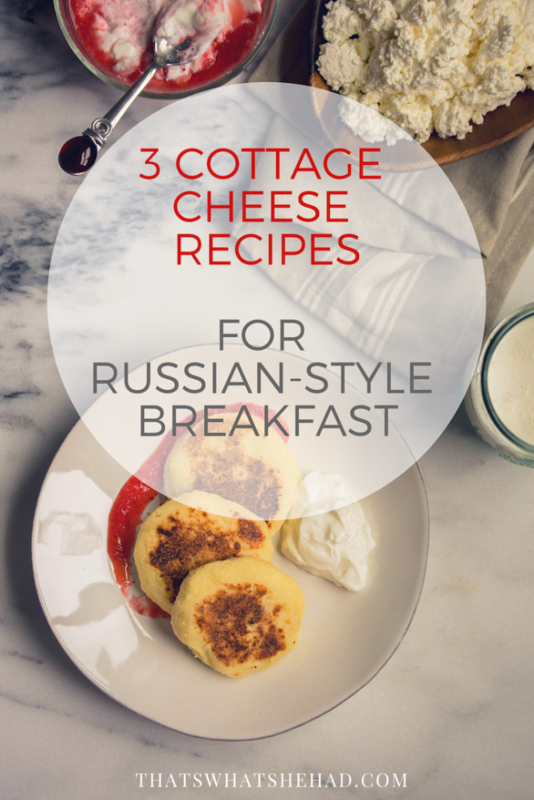 But if you want to make something more elaborate, here are 3 cottage cheese recipes for your Russian-style breakfast! 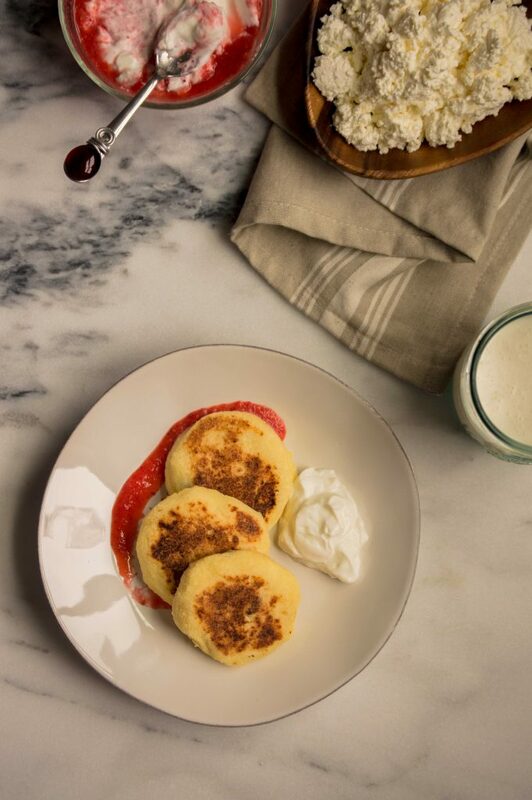 Sirniki is a way for Russian women to shake things up a little and make something different for breakfast or… use up the leftovers of cottage cheese that is about to go bad. Slavic women are incredibly economical and never throw away food. I guess, that’s how cottage cheese itself was born: milk has gone bad, but one thrifty woman couldn’t bare wasting it, so she just decided to wait some more and see what’s going to happen. Cottage cheese happened. The recipe for sirniki is quite easy, but I won’t lie to you, there is a trick. To prepare the dough for patties you will need cottage cheese, eggs and flour. Depending on how dry your cottage cheese is you might need a little more or a little less flour. If you add too much flour the patties will come out hard. If you add too little, they will turn into a runny mess on the frying pan. Although I give particular measurements in the recipe, you should feel free to make slight changes if you see the dough isn’t coming out right. I have two tips to get the dough right. First, when making cottage cheese try to squeeze out all the liquid. The dryer the cottage cheese is, the less flour you will have to add, the softer sirniki will turn out. Second, use semolina flour instead of wheat flour. It helps to make sirniki soft and tender. Soak raisins in warm water for 10 minutes to make them softer. Sift cottage cheese through a fine strainer. Add 1 egg and sugar to cottage cheese and mix well. Add 3 tbsp of semolina flour and mix until you get smooth thick dough-like mixture. Add raisins to the mixture. Preheat a frying pan and melt 1 tbsp butter. Take some cottage cheese dough and roll it into a ball. Press it with your fingertips to get a round ½ inch thick patty. Roll the patty in semolina flour and place on the pan. Fry the patties on each side over medium heat until golden brown (approximately 3 minutes on each side). Frying the patties over medium heat will ensure they become golden on the outside and cook through inside. Take out of the pan, place on paper towel and remove access oil. Serve with sour cream and jam (or honey). I know all these Russian words sound weird, so to make it easier think of ravioli or dumplings. Vareniki is somewhat like Italian ravioli – a piece of dough with filling inside. The fillings can vary from sweet (cherry or cottage cheese) to savory (potato or mushrooms). 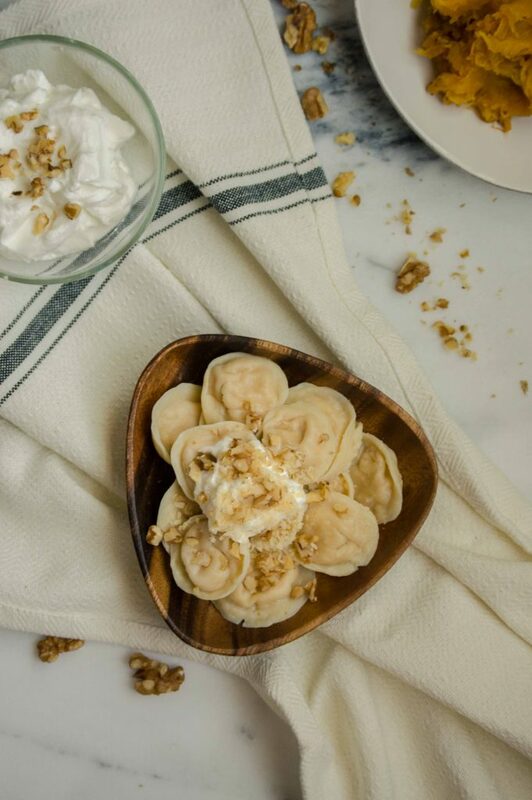 If the filling is made of meat, then vareniki are called pelmeni. I have written a thorough guide to making pelmeni from scratch. Please visit this page to see a detailed instruction on how to prepare the dough and shape pelmeni. There’s a video in the bottom of the page too. It will help you a lot since pelmeni and vareniki are essentially the same thing with different fillings. Just substitute cottage cheese for meat and you are good to go. In the recipe below I added some baked pumpkin to the filling. Mainly because it’s fall season, and I recently bought a pretty pumpkin. Not because that’s a common combination in Russia. Feel free to leave it out and make plain cottage cheese vareniki, they are every bit as delicious. I have to say that this recipe is not easy and quite time-consuming. The good news is that you can make vareniki in advance and keep them in the freezer for months. So once you made them, all you have to do in the morning is boil them for 5 minutes! That is it. I have once read a saying: if you want to make food taste French – add butter, if you want food to taste Chinese – add soy sauce, if you want food to taste Russian – add sour cream. Couldn’t agree more. The most common way to serve vareniki in Russia is with sour cream. Crack egg into a cup and add oil. Sift flour into a separate bowl and make a hole in the center. Pour egg mixture into the center. Mix the dough with a mixer for 10 minutes using dough hook. When all the wet ingredients are mixed in and the dough forms a ball, place it on the table with the leftover flour. Knead the dough until it stops sticking to your hands. You might need to add a little more flour depending on its quality. Cover the dough and leave it to rest for 30 minutes to 2 hours. After resting the dough will become softer and easier to work with. Knead for a couple more minutes to get a uniform mixture. If after resting the dough still sticks to your hands, add a little more flour. Bake pumpkin for 40 min until the flesh is soft and the fork can be inserted easily. Cool down the pumpkin and scrape out the flesh. You will need ½ cup of pumpkin flesh for this recipe. Mix 1 cup cottage cheese with ½ cup of pumpkin flesh. Add sugar and cinnamon and mix well. Cut a stripe of dough and roll it into a cylinder approximately 2 cm (1 inch) in diameter. Tip: keep the rest of the dough covered to prevent it from drying. Cut up the cylinder into 1 cm (0,5 inch) pieces and place it on the table dusted with flour. Take 1 piece at a time and roll it in between your fingers to make a round. Roll every round as thin as you can using a rolling pin. This part is tricky because you want it to be as thin as possible for better taste. But if you roll it too thin, the dough will break when you boil vareniki. There’s no way around but practice and more practice until you get the feel of what is perfect thickness. Place rounds of dough on top of each other to prevent them from drying. Before starting the process of making vareniki turn the stack upside down so that the first round you made is on top now. Hold the round in your left hand and place a tea spoon of filling with your right hand on the lower part of the round. Remove any excess filling. Place the upper part of the round on top of the filling and start sealing edges. Start from the center and work your way down one side, then the other side. You can seal the ends of vareniki together like I did, or you can leave them half-moon shaped which is how it is traditionally done in Russia. Place vareniki on a board dusted with flour and keep it in freezer. Fill a cooking pan with water and bring it to boil. Add salt (1 tsp of salt for each 1 liter of water). Place desired amount of vareniki into a pan. Tip: don’t give in to temptation of placing a lot at once. Keep it down to 25 pieces at a time. After you add vareniki to boiling water the water will cool down and you will need to wait for it to boil again. Mix vareniki carefully with a slotted spoon making sure none are stuck to the bottom of the pan. After vareniki come up to the surface of water cook it for another 3 minutes, then take it out using a slotted spoon. Serve immediately with sour cream. You can add some grated coconut and chopped nuts for decoration. If you make cottage cheese at home like I advise you to, apart from having cottage cheese you will also have a lot of whey left. Whey is greenish liquid that is left after you strain the cheese. Although it looks weird and possibly unappetizing, don’t pour it out. You can use it to make Russian pancakes – blini. And then stuff those blini with cottage cheese. 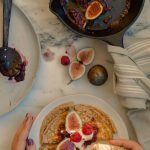 A breakfast fully made from scratch – does it get any better? I guess, it’s better to compare Russian blini to French crepes, since they are very thin, unlike American pancakes. Blini in Russia are a really big thing that I should probably dedicate a separate post to. They are a popular breakfast item and can be served with melted butter, honey, jam and, you guessed it, sour cream! 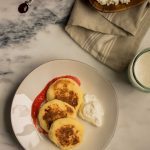 To make them more filling, blini can be stuffed with meat, fish, berries, or cottage cheese. Sift flour into a bowl. Add sugar and salt and mix together. Add two cups of whey and mix well using a whisk. Add 1 egg and continue whisking. The mixture should be runny. If you insert a spoon the dough should coat the surface of the spoon. Place a pan over medium heat and grease it with butter. When the pan is hot use a ladle to pour the dough into the pan. 1/3 of a ladle should be enough to cover the surface of the pan. Hold a ladle with your left hand and the pan with the right one. When the dough touches the hot surface of the pan start moving your right hand in circular motions to make sure the dough spreads all over the pan. Place the pan back on the stove and wait for about a minute till the dough becomes golden brown on the bottom. Flip the dough with a spatula and fry for another 30 sec. Stuff each blin with cottage cheese. Either place 2 tbsp of cottage cheese in the middle of crepe and fold the edges like an envelope or spread cottage cheese on ¼ of the crepe, fold in half and again in half (you will get a triangle shape like on the picture). Serve with sour cream, jam or honey. You can use 1 cup milk and 1 cup water instead of 2 cups of whey. Cast-iron pan works incredibly well for making blini. Although non-stick pan is fine too. 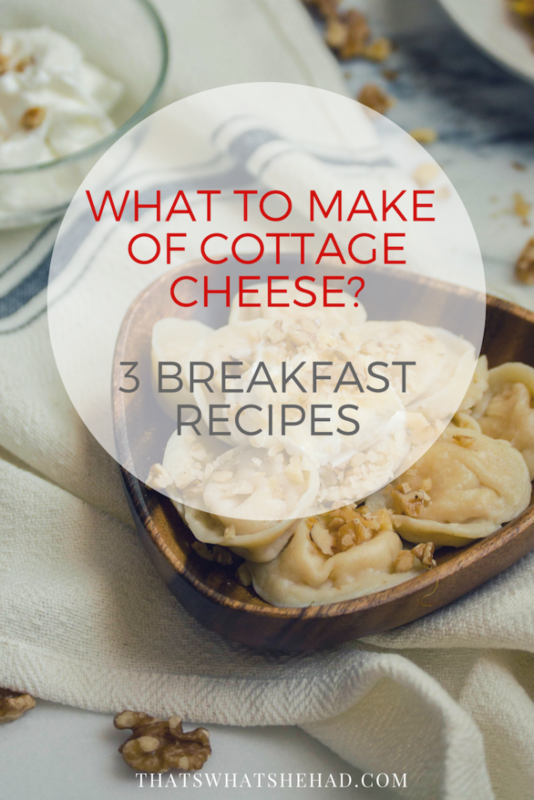 What are your favorite cottage cheese breakfast recipes? Share ideas in comments! I just found this blog and it is great. Will keep on reading it that is for sure. Thank you for your original touch. But I think it will be fare to clarify that vareniki is Ukrainian dish and pelmeni is Chineese.